Derek and Lydia Prince mentored many young believers who came to faith during the Jesus Movement, including my wife Susan and me. The special way this book captures and presents Lydia Christensen Prince's heroic and pioneering faith had a galvanizing and lasting influence in our lives. We pray that this anniversary edition impacts thousands of young believers in a similar way today. There are two books which have profoundly affected my spiritual walk. The first was The Hiding Place, the second Appointment in Jerusalem. Lydia's intimate relationship with Jesus, the way she was led by the Holy Spirit, her devotion to prayer, her sacrifices, and her walk by faith were awe-inspiring. It is a life-changing book. 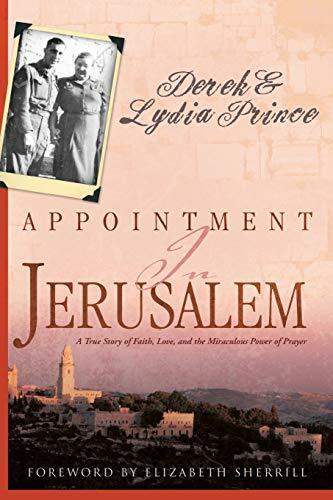 "The true story of Lydia Christensen Prince's journey from affluent Danish schoolteacher to 'mother' of abandoned Jewish and Arab orphans in Jerusalem"--Provided by publisher.